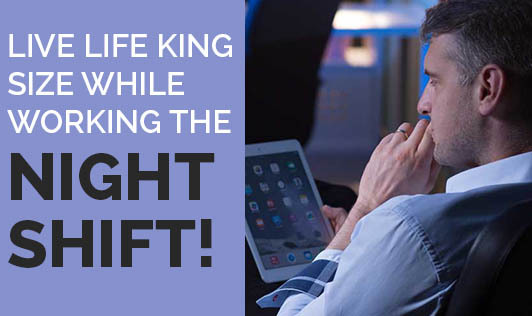 Live Life King Size while Working the Night Shift! Working the night shifts has both advantages and disadvantages, and it is definitely in your hands to get the best from this routine. Most of the people who are on night shifts have given up on the idea of healthy living, as time management is a big concern. Here are a few tips to improve your lifestyle and eating habits while working the night shift. A few obvious advantages of working on a night shift are a better pay package and longer hours for yourself in the day. The disadvantages of this shift system are that, a few people end up sleeping more than usual, say about 15extra hours a week and end up having very less time to spend with family and friends. A few other disadvantages include fluctuations in a few hormone levels, low melatonin levels due to lack of exposure to the sun, and also an imbalance in work-life leading to depression. • Firstly, ensure you get just the right amount of sleep to feel fresh, and no extra hours of sleeping. This will make you lazy and hinder you from utilizing the rest of the time well. • Plan your day well and pay up all your bills, do the household chores and join a club. Follow your heart and your hobby. Exercise can keep your energy levels and your health in a good shape. • You have enough time in the day to socialize and catch up with your buddies and family. Make the best use of it. • Insomnia, lack of sleep is a common concern while working on a night shift. You can fight insomnia by soothing and relaxing your body and muscles with a glass of warm milk before sleeping. Avoid coffee as caffeine will keep you awake. Let your windows and doors be covered with thick curtains and use ear plugs to drown out outside noise if needed. Instead of letting this routine take a toll on your health, manage your time well and make the best use of night shifts.